the Church of the Nativity of the Mother of God at Kuriste. In 1883, four farmers from Lelu village in Käina vald were attending services at the Orthodox Church in Haapsalu. At the beginning of 1884, one of them, Tõnis Padu of Matse, invited the priest who was in Haapsalu (likely Nikolai Poletajev, who served there from 1879-1888) to the island. In June of the same year, the Haapsalu priest visited Anton Padu, who had already received this new name upon his chrismation, and chrismated another 14 families in Lelu. Thus the foundation was laid for the Emmaste-Lelu (later Emmaste-Kuriste) Orthodox congregation, Hiiumaa’s present Church of the Nativity of the Mother of God at Kuriste. The congregation was officially created on November 9th, 1884, at Matse farm in Lelu village, where an Orthodox elementary school was also soon opened. The founding of an Orthodox congregation at Kuriste was followed by a wave of conversions to Orthodoxy. The people wanted to participate in worship that engaged all of a person’s senses and also distinguished itself in that separate services were not celebrated for the simple people and the upper class, as was the practice in Lutheran congregations at that time. By the end of the 19th century, there were about 1500 Orthodox people on Hiiumaa, and by the beginning of 1913, the number of Orthodox Hiiumaa residents had risen to 3384 (Riho Saard, “Hiiumaa and her residents buffeted and constrained by religious winds,” Tallinn 2009). 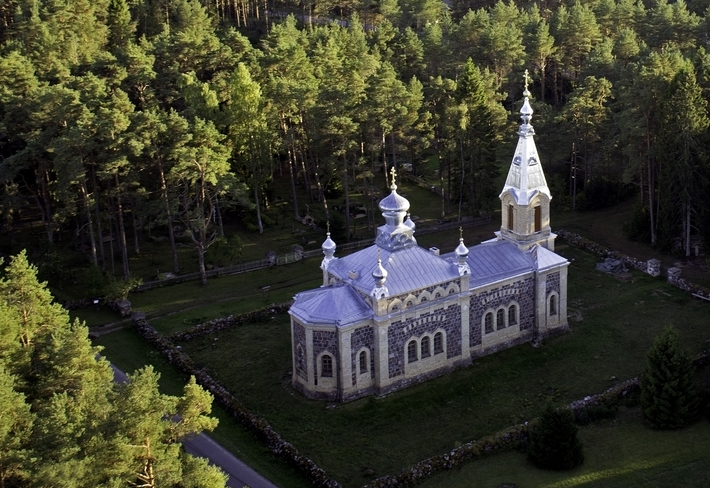 This was the reason why, at the end of the 19th century, in the course of only a couple of years, two more houses of worship in addition to the Kuriste church were built, one in Kuri village and another in the forest at Puski.